Manchester United survived a stirring fightback from Manchester City to win a thrilling FA Cup third-round derby at the Etihad Stadium. The drama started before kick-off when United announced Paul Scholes was coming out of retirement to play until the end of the season and was named on the bench. And it did not let up for a pulsating 90 minutes which threatened a United rout as they established a three-goal lead by half-time, but ended with Sir Alex Ferguson's side hanging on as City tried to complete the most unlikely comeback. City were also fuelled by a burning sense of injustice after losing influential defender and captain Vincent Kompany to a contentious early red card from referee Chris Foy after a two-footed challenge on Nani. United were already ahead courtesy of Wayne Rooney's header - and with City suffering a numerical disadvantage the visitors punished their neighbours in a style that, at one point, threatened complete revenge for their 6-1 thrashing at Old Trafford in October. Danny Welbeck added a second before Rooney was on target again from a rebound after his penalty was saved by City's stand-in goalkeeper Costel Pantilimon, who was in for the rested Joe Hart. Roberto Mancini's side refused to capitulate in adversity, mounting a response that ultimately failed to rescue the game but did great credit to their resilience and determination. Aleksandar Kolarov's free-kick reduced the deficit and, when Sergio Aguero took advantage of Anders Lindegaard's handling error with 25 minutes left, City had real hopes of forcing a replay. United held on, but boss Ferguson was clearly unhappy with the carelessness demonstrated by his team that threatened to allow a comfortable situation and a place in the fourth round slip from their grasp. Scholes was introduced just before the hour but, understandably, looked very short of match sharpness. He spread some trademark passes and had a low shot saved, but the 37-year-old also tired rapidly and gave the ball away for City's second goal. When the rumoured return of Scholes became a reality he was afforded a rapturous reception from United's supporters as he came out to warm up. And, after the visitors survived early pressure from City, their fans were celebrating again when Rooney soared to meet Antonio Valencia's cross and direct a fine header beyond Pantilimon via the underside of the bar. Matters were made considerably worse for City two minutes later when Kompany was sent off for his challenge on Nani, which referee Foy deemed worthy of a red card despite the Belgian appearing to get the ball. This twin setback left City unsettled and United took advantage to add two further goals and assume total control by the interval. Welbeck's second on the half hour was a triumph of athleticism and technique for the young England striker. He reacted superbly when Patrice Evra's cross deflected off Samir Nasri to hook his finish beyond the stretching Pantilimon. The game looked to have been pushed beyond City's reach when Rooney got his second when referee Foy correctly pointed to the spot following Kolarov's late tackle on Welbeck. Rooney's spot-kick was saved by Pantilimon but rebounded kindly to allow the former Everton man to head home and leave City's players and supporters stunned. And yet Mancini's men gathered themselves during the break to mount a stirring recovery. Mancini made a double change, taking off David Silva and Adam Johnson for Stefan Savic and Pablo Zabaleta. City were back in the game within three minutes of the restart as Kolarov sent a fine free-kick into the corner from 20 yards to offer hope of an unlikely comeback. This was the signal for Ferguson to reintroduce Scholes in place of Nani - but he was to quickly play an undistinguished part as City further cut the arrears. The veteran lost possession and when Lindegaard failed to hold Aguero's shot, the Argentine followed up to score with ease. The momentum was with City and as the game entered its closing stages another ex-England player hit the comeback trail once more as Owen Hargreaves replaced the disappointing Nasri. City had a penalty appeal turned down when Phil Jones handled, but United should also have been awarded a second spot-kick earlier when Kolarov fouled Valencia. There was still time for Kolarov to sting Lindegaard's palms with a free-kick in the dying seconds, but the parried effort was cleared by some frantic United defending. The final whistle brought a standing ovation from both sets of supporters - United's for the victory and a measure of revenge and City's for a show of strength from their side. 90:00+3:17 The final whistle goes and the game is over. 90:00+2:42 Outswinging corner taken by Aleksandar Kolarov from the left by-line. 90:00+1:42 Strike on goal comes in from Aleksandar Kolarov from the free kick, save made by Anders Lindegaard. 90:00+1:42 Booking Rio Ferdinand booked. 90:00+1:18 Rio Ferdinand concedes a free kick for a foul on Micah Richards. 84:54 Patrice Evra challenges Sergio Aguero unfairly and gives away a free kick. James Milner restarts play with the free kick. 84:06 James Milner concedes a free kick for a foul on Rio Ferdinand. Direct free kick taken by Anders Lindegaard. 83:14 Foul by Antonio Valencia on Aleksandar Kolarov, free kick awarded. Aleksandar Kolarov restarts play with the free kick. 81:54 James Milner takes a inswinging corner from the left by-line played to the near post, Wayne Rooney manages to make a clearance. 81:05 Substitution Owen Hargreaves on for Samir Nasri. 74:09 Costel Pantilimon takes the free kick. 74:09 Substitution Danny Welbeck goes off and Oliveira Anderson comes on. 74:09 The official flags Wayne Rooney offside. 71:56 Shot by Paul Scholes. Comfortable save by Costel Pantilimon. 71:35 Phil Jones delivers the ball, clearance by Micah Richards. 64:10 James Milner provided the assist for the goal. 64:10 GOAL - Sergio Aguero:Man City 2 - 3 Man Utd Sergio Aguero grabs a goal from inside the six-yard box to the bottom left corner of the goal. Man City 2-3 Man Utd. 63:48 The ball is crossed by James Milner, Sergio Aguero takes a shot. Fantastic save by Anders Lindegaard. 60:53 Sergio Aguero gives away a free kick for an unfair challenge on Patrice Evra. Free kick taken by Anders Lindegaard. 58:48 Substitution Paul Scholes is brought on as a substitute for Luis Nani. 58:31 Effort from outside the box by Wayne Rooney goes wide right of the target. 56:29 Michael Carrick gives away a free kick for an unfair challenge on Samir Nasri. Joleon Lescott takes the direct free kick. Correction - 54:41 Shot by Phil Jones from 18 yards. Stefan Savic gets a block in. 54:41 Phil Jones takes the chance to get an effort at goal. Stefan Savic gets a block in. 51:49 Wayne Rooney has shot on goal from just outside the box which goes wide of the right-hand upright. 51:25 Short corner taken by Ryan Giggs from the right by-line. 50:42 A cross is delivered by Antonio Valencia, Luis Nani has a headed effort at goal from deep inside the area missing to the left of the target. 49:53 Free kick awarded for a foul by Luis Nani on Pablo Zabaleta. Pablo Zabaleta takes the direct free kick. 49:08 The ball is sent over by Luis Nani, save made by Costel Pantilimon. 47:46 Assist on the goal came from Micah Richards. 47:46 GOAL - Aleksandar Kolarov:Man City 1 - 3 Man Utd Aleksandar Kolarov hits the back of the net with a goal direct from the free kick from outside the penalty box to the bottom right corner of the goal. Man City 1-3 Man Utd. 47:05 Booking Patrice Evra is given a yellow card. 46:56 Free kick awarded for a foul by Patrice Evra on Micah Richards. 45:01 Substitution Stefan Savic on for David Silva. 45:01 Substitution Pablo Zabaleta joins the action as a substitute, replacing Adam Johnson. 45:00+2:05 The players leave the pitch at half time. 45:00+1:13 David Silva fouled by Michael Carrick, the ref awards a free kick. Samir Nasri takes the direct free kick. 45:00+0:28 The ball is crossed by Antonio Valencia, Effort from close range by Danny Welbeck goes wide left of the target. 44:53 The ball is delivered by Ryan Giggs, Joleon Lescott manages to make a clearance. 41:55 Wayne Rooney takes a shot. Comfortable save by Costel Pantilimon. 40:22 Luis Nani is penalised for a handball. James Milner takes the free kick. 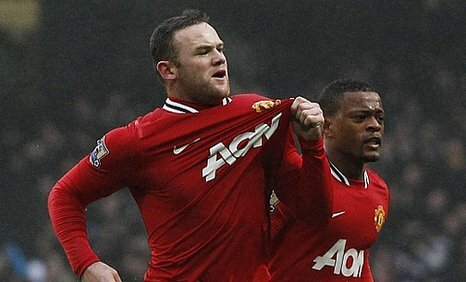 39:11 GOAL - Wayne Rooney:Man City 0 - 3 Man Utd Wayne Rooney finds the net with a headed goal from close range. Man City 0-3 Man Utd. 39:03 Penalty taken by Wayne Rooney saved by Costel Pantilimon. Man City 0-2 Man Utd. 38:13 Foul by Aleksandar Kolarov on Danny Welbeck, Penalty awarded. 37:47 Long range shot from Wayne Rooney misses to the left of the goal. 35:37 Booking Luis Nani is shown a yellow card. 33:58 Aleksandar Kolarov takes the direct free kick. 33:58 Booking The referee shows Danny Welbeck a yellow card. 33:53 Danny Welbeck concedes a free kick for a foul on Aleksandar Kolarov. 29:56 Assist by Patrice Evra. 29:56 GOAL - Danny Welbeck:Man City 0 - 2 Man Utd Danny Welbeck grabs a goal from just inside the penalty area to the top right corner of the goal. Man City 0-2 Man Utd. 29:15 Free kick awarded for a foul by Samir Nasri on Ryan Giggs. Michael Carrick takes the free kick. 26:30 Sergio Aguero produces a drilled left-footed shot from deep inside the penalty box which goes wide of the left-hand post. 26:09 Luis Nani has a drilled shot. Joleon Lescott gets a block in. 24:40 Free kick awarded for an unfair challenge on Sergio Aguero by Phil Jones. Aleksandar Kolarov restarts play with the free kick. 23:20 Corner taken by Adam Johnson, save by Anders Lindegaard. 23:11 Shot from 20 yards from David Silva. Rio Ferdinand gets a block in. 20:50 The ball is sent over by Phil Jones. 19:07 Foul by Ryan Giggs on Sergio Aguero, free kick awarded. Free kick taken by Nigel De Jong. 13:52 Inswinging corner taken left-footed by Adam Johnson. 13:34 Shot by Sergio Aguero. Save made by Anders Lindegaard. 12:00 Free kick taken by Ryan Giggs. 11:28 Sent off Vincent Kompany sent from the field by the ref for serious foul play. 11:16 Foul by Vincent Kompany on Luis Nani, free kick awarded. 9:16 Assist on the goal came from Antonio Valencia. 9:16 GOAL - Wayne Rooney:Man City 0 - 1 Man Utd Wayne Rooney finds the back of the net with a headed goal from inside the area. Man City 0-1 Man Utd. 7:18 Patrice Evra gives away a free kick for an unfair challenge on Adam Johnson. Aleksandar Kolarov delivers the ball from the free kick left-footed from right wing, blocked by Danny Welbeck. 3:22 Joleon Lescott challenges Danny Welbeck unfairly and gives away a free kick. Free kick taken by Phil Jones. 2:24 The ball is delivered by James Milner, Rio Ferdinand manages to make a clearance. 0:58 Antonio Valencia concedes a free kick for a foul on Aleksandar Kolarov. Aleksandar Kolarov takes the free kick.